The lists below consists of conditions osteopaths are taught to treat at undergraduate and post graduate level. We have a duty to encourage patients to seek the medical advice and treatment they may need and if after exploring their treatment options with their GP they are looking for an alternative therapy we have provided information as to how osteopathy may help with a variety of conditions. After the age of 20 the body slowly starts to degenerate! This is due to the lack of daily movement many of our joints get. Each joint is bathed in synovial fluid which acts as a lubricant and replenishes the joint structures. Every time a joint moves the fluid is pumped around the joint. Old fluid is pumped out and new fluid is pumped in. If we don’t move our joints very much (for example the natural ageing process/being sat at a desk / in a car for long periods our body becomes stagnant and the movement of fluids slows. As we get older cartilage starts to become brittle and worn, ligaments and tendons become tough and loose elasticity. Any imbalances in weight bearing form side to side will cause the cartilage to wear down in a joint, usually the knee or hip or the spine, and then abnormal bony growths / spurs will form around the edge of the joint where the cartilage should be. This then can cause bone to rub against bone, or the bony spurs may irritate surrounding nerves and ligaments and then the joint swells and becomes painful, therefore further complicating the problem as one tends not to move a painful area and so excess fluid can become trapped within the joint capsule. HOW CAN OSTEOPATHY HELP? A great deal actually! We have specific techniques that can help to drain swollen areas and get the fluid pumping through the joints, we can advise you on ways to do this at home too. Also we are able to breakdown the stiffness that has developed within the muscles around the joint, this helps reduce pain and increases mobility. Blood supply to the area will also be increased by massage techniques which can stimulate repair and regeneration. Most importantly we will seek out the cause for why a specific area has degenerated, whether it is simply a postural alteration that needs to be made or a pelvic / spinal problem that has thrown the centre of gravity onto structures not designed to deal with the forces. 4 out of 5 people suffer from back pain at some point in their life, the role of pain is to make us aware of the fault so that we can fix the problem, (sadly we don’t treat our bodies like an expensive car – if a warning light comes on, one takes the car straight to the garage!). We often ignore or put up with the pain and the longer spinal faults go unchecked the more the body has to compensate for the problem and the more widespread the strain suffered by the skeleton as a whole. The body is very good at compensating though – lucky for us! So whilst your back pain may seem to have gone away after a strain or injury, quite often it hasn’t! – The pressure may have been taken away due to the compensations made, but the problem still exists – just more comfortably for you. Prolonged compensations however lead to a disruption of the spinal mechanics and one day the bodies compensatory mechanism reaches its limit and a severe acute and debilitating back pain can arise from a simple movement (putting socks on, twisting etc) this is why it is so important to have past injuries checked and recent injuries dealt with quickly and completely. We will not only find and treat the root cause of your problem but will advise you on rehabilitation and preventative measures to reduce future problems. Is caused by compression of the median nerve as it passes through the carpal tunnel from the wrist into the hand. The nerve is surrounded by a sheath and may be compressed due to fluid retention as in pregnancy or due to inflammation of the sheath from over-use. Symptoms can be pain / pins and needles / weakness and numbness of the middle 3 fingers of the hand. Osteopaths have a number of techniques that can be very helpful in releasing tension from the sheath and draining excess fluid, we can also give you exercises to help to release the tension around the nerve. These conditions are hereditary and usually present from birth. They tend not to be too much of a problem unless the rib cage is severely twisted of deformed, in many cases osteopathic treatment can be of benefit and will help to improve rib movement and reduce spinal twists that compensate for the chest deformity. A common complaint for osteopaths. There are many types of disc injury, ranging from a mild bulge / herniation to a complete prolapse where the fluid from the disc has leaked out and is compressing a nerve. Disc injuries require careful and gentle treatment and severe cases may require surgery. If you have previously had surgery to remove discs or fuse the spine we can also help with rebalancing the spine to reduce any pressure areas that build up due to the fusions as when one area is fused it can create other areas to have increased strain. Frozen stage – (the shoulder basically has little if any movement available and is very painful. A frozen shoulder can right itself but it can take at least 18 months, osteopathy can help to reduce that time and also look to see why the problem occurred and correct any structural problems which may lead to the other shoulder freezing or a re-occurrence of the original frozen shoulder. Patients with shoulder problems in general have a typical posture type which causes the shoulder function to be compromised. See the article written by Quentin Shaw on Shoulder problems and the swayback posture. Headaches can be a common symptom of poor spinal balance creating tension throughout the muscles of the upper back and neck leading to a reduction of blood supply to the head, or congestion in the head as the blood cannot move freely to and from the head (cervicogenic headache). Other factors such as diet, stress and chemical / hormonal imbalances may also contribute. There are many children and adults suffering from chronic headaches unnecessarily, and whilst painkillers can help to alleviate the pain they do not address the cause, and long term use can be harmful. A thorough medical history will be taken to assess all of these factors. Most cervicogenic headaches can be relieved by a course of osteopathic treatment. There are many different causes of hip and groin pain, and it isn’t always due a problem with the actual hip joint. A problem in your lower back may cause referred pain to the hip, or a muscular spasm in the gluteal region due to chronic bad posture will refer pain to the hip. There may also be degeneration (osteoarthritis) of the hip joint. Or a simple groin strain. We will be able to diagnose the source of the problem and refer you for x-rays if needed. Treatment will aim to balance and align the hip joints with the spine, release tight muscles and any extra pressures from the hip.If a hip replacement is necessary we can help with rehabilitation. The knee joint is a complex joint and also is an area prone to having referred pain from a lower back / disc or nerve problem, therefore knee pain may not necessarily mean a problem with your knee. Quite often knee joints suffer early degeneration due an imbalance of the weight bearing through the knees due to a pelvic twist, the twist causes the axis of one hip to rotate inwards which throws more weight onto that knee and therefore the increased strain and stress create wear and tear. If surgery seems the only option we will refer you to your GP and help you with rehabilitation. We will carry out tests to diagnose the tissue causing your pain, in any area of the body. If we suspect a problem that requires a scan or specialist referral we can advise you on the appropriate steps to take. Is a common problem osteopaths deal with, it can have many causes. From the acute locked neck, to general strain of the neck accompanied with headaches. With today’s lifestyle of computers smart phones and desk work, the average neck lacks being used in all of its ranges of motion, along with bad work posture the muscles begin to shorten and tighten, which can lead to tension across the shoulders which will affect the blood supply to the head causing headaches. The neck is often the symptomatic and painful area in the body due to the compensations the body has made for an original problem lower down for example in the lower back, so in this case just treating the neck will have only short term relief as the problem will return if the primary problem in the lower back isn’t dealt with. We will assess your whole spine and pelvis to ensure we find the root cause of your problem. Are a very common occurrence, and will give extreme shooting pains within the area that the specific nerve supplies. It may also cause pins and needles / numbness / decreased sensation / muscle weakness / muscle twitching / spasm. Often a nerve is not completely trapped but compressed by surrounding soft tissue structures i.e. a bulging disc / muscle spasm, or swelling from an injury. There are also cases with osteoarthritis where bony spurs can press into or trap a nerve. And in more serious cases growths either benign or malignant can trap nerves. We will be able to identify the nerve involved by our clinical testing. If the nerve irritation is caused by a musculoskeletal problem we have various techniques that are very successful in releasing pressure from the nerve. If your osteopath feels that an x-ray or scan is needed then we will refer you to your doctor. An ever increasing problem caused by repetitive movements, it can affect muscles, tendons and ligaments and is associated with swelling around a joint or within the sheath that surrounds a tendon / ligament. Pain varies from moderate to severe, and usually the only medical option is corticosteroid injections into the area and some times surgery. How can osteopathy help? – We will begin by diagnosing why the problem has occurred and offer you advice as to how best to rest the area, how to improve postures to prevent a re-occurrence. We will assess the body mechanics, to check whether a weakness has been caused from a structural imbalance, for example with a tennis elbow our attention will be on how the shoulder girdle hangs from the spine, a twisted pelvis causes the shoulder girdle to twist in the opposite way to compensate this will cause the shoulders to rotate in or out which will affect the angle of the elbow and can cause muscle tension and stiffness, as many of the elbow muscles attach to the shoulder girdle. Treatment will vary depending on the cause of the problem, we have techniques designed specifically to release the swelling and painful / over-tight muscles around the area and if the problem is more complex, the whole spine and pelvis may need addressing. The sciatic nerve runs from the lumbar spine, behind the buttock muscle and down the back of the leg. Sciatica is the term used to describe pain along the distribution of the sciatic nerve. It is usually caused by back problems and / or a twisted pelvis. The sciatic nerve exits the spinal cord via a pathway between 2 vertebrae; the sciatic nerve has a number of exit points in the lumbar spine. There are a number of ways the sciatic / or any other nerve in the spine may be affected; If one or more of these inter-vertabral joints become strained or twisted they can swell and irritate the nearby nerve, effectively trapping it. Or degeneration / prolapse of a disc can do the same. A pelvic twist can cause the piriformis muscle to squeeze the nerve one side. Even though most of the time sciatica is due to a spinal problem the pain may only be felt in the leg. This is called referred pain, if the nerve is compressed it may cause pain, reduced muscle tone and a reduction in sensation/numbness within the area that it supplies. We can bring relief by finding the source of the pain and treating the root of the problem. If it seems like osteopathic treatment is not suitable and further investigation is necessary we will inform you and refer you to your GP for a scan/ x-ray or further tests. Scoliosis is a complex three dimensional spinal curvature. The spine curves sideways and rotates causing an “S” or “C” shaped spine. The most commonly affected areas are the chest (thoracic scoliosis) or the lower back (lumbar scoliosis). The spinal deformity is accompanied by an imbalance in the ribs and associated musculature. Scoliosis can be hereditary so if you or someone in your family has it, we recommend any children to have a spinal assessment. Scoliosis can also be an acquired problem and develop at any age as the spine may be twisting due to a chronic problem occurring in the pelvis from a fall or injury that causes a misalignment in the pelvic base therefore the spine becomes curved to compensate. 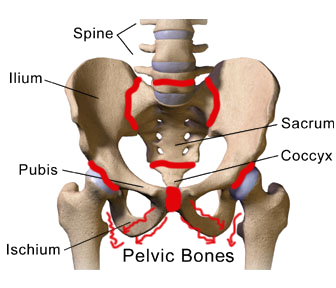 Correcting these pelvic problems can reduce many scoliotic tendencies. Specific exercises will be given to reduce the rotation of the spine and maintain balance within the spinal column. Quentin Shaw specialises in spinal problems including scoliosis. If a scoliosis is particularly severe surgery may be the only option, however osteopathic treatment can still help to rebalance the soft tissues once the spine is fused. We treat a lot of minor sports injuries, we have a sports massage therapist who works with us and will help with any muscular problems. Osteopaths are able to correct structural problems arising from injury which can reduce healing times and prevent future injury. We will advise you on stretches and rehabilitation exercises. Quentin Shaw the principal osteopath specialises in treating this condition. It is a very complex condition of the pelvis which challenges most osteopaths and physiotherapists. Quentin is recognised by many doctors, midwives and obstetricians for his work. This can be an extremely painful and debilitating condition, quite often under diagnosed or just dismissed as normal pregnancy pain! See our section specifically for Pelvic Girdle pain / SPD. Are a very common occurrence, and will give extreme shooting pains within the area that the specific nerve supplies. It may also cause pins and needles / numbness / decreased sensation / muscle weakness / muscle twitching / spasm. Often a nerve is not completely trapped but compressed by surrounding soft tissue structures i.e. a bulging disc / muscle spasm, or swelling from an injury. There are also cases with osteoarthritis where bony spurs can press into or trap a nerve. And in more serious cases growths either benign or malignant can trap nerves. We will be able to identify the nerve involved by our clinical testing and diagnose how and where it is trapped / compressed and we have various techniques that are very successful in releasing pressure from the nerve. If your osteopath feels that an x-ray or scan is needed then we can refer you.